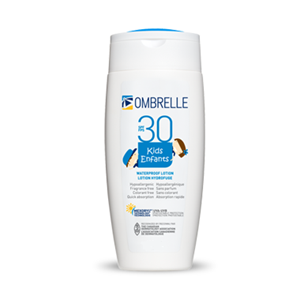 Ombrelle Kids Waterproof Lotion ,Ombrelle Kids Waterproof Lotion with SPF 30 to protect your kids against the sun! Ombrelle Kids Waterproof Lotion is specially formualted for kids which has a moisturizing effect with SPF 30 sun block. This lotion is water resistant and fast drying. This broad spectrum formula provides photostable protection against Ultra Violet A and Ultra Violet B rays. Ombrelle is a dermatologist recommended lotion. Oxybenzone 5%, Octisalate 5%, Octocrylene 3.5%, Titanium Dioxide 3.3%, Avobenzone (Parsol 1789) 3%, Terephthalylidene Dicamphor Sulfonic Acid (Mexoryl SX) 1%, .